PES 2014 looks like the biggest returning of the popular series and one of the best instalments in many years. But it seems that the developers of its main competitor - FIFA 14 - try to throw sand in its wheels. Konami has announced that because of EA's politics some clubs and stadiums will be excluded from PES. It became known that EA has signed rather insidious contract with European clubs and so PES 2014 won't include Spanish stadiums and clubs together with several other main European stadiums. Unfortunately this news has turned to be a surprise for Konami, and so the company is not ready to develop and implement other football playgrounds instead of the excluded ones before the game's release on the 20th of September. So there will be only 20 stadiums this year, but Konami wants to assure the fans that next year the developers will expand this amount. Also Stadium Editor will be removed from the game again because of the licensing. And another one feature that will be excluded from PES 2014 functionality is the rain, which was announced previously. The developers understood that they have no time to implement the rainy weather and, that is more important, the physics of the ball and footballers, when it rains. Konami decided that it is better to release the game without crashes, then the game that has lots of functions and lots of bugs. And what do you think about this news? 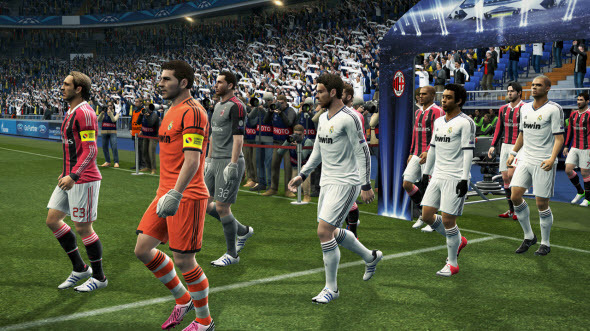 Do you still like PES 2014 functionality, or will you choose FIFA 14 this year? We are waiting for your opinion in the comments below.